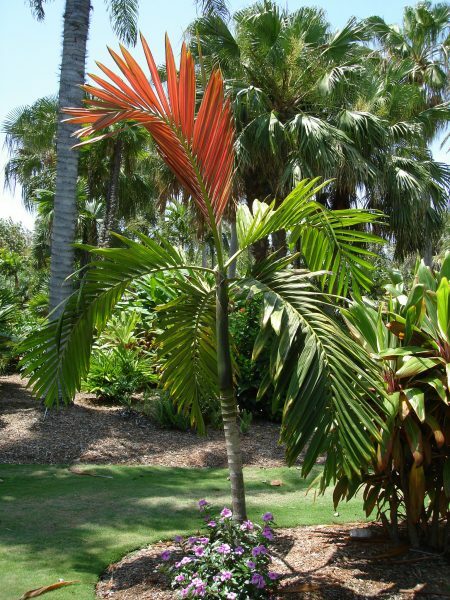 Solitary, feather-leafed, crownshaft palm. Trunk to 10 inches thick. Deep green leaves emerge a brilliant red. Overall height to 30 feet with a spread of 12 feet. Requirements Grows well in alkaline and acidic soils. Growth rate medium. Can tolerate short cold snaps to just below freezing. Has a slight salt tolerance. For more information on any specimen please email us or call 561.333.6889. © 2019 D'Asign Source, all rights reserved.